Snow can be quite heavy, ranging from 3-5 pounds per square foot. The average commercial roof can support up to 4 feet of fresh snow before becoming strained. Packed snow is heavier than fresh snow. As a commercial building owner or manager, you need to know the basics of how snow affects your roof and when to take maintenance action. 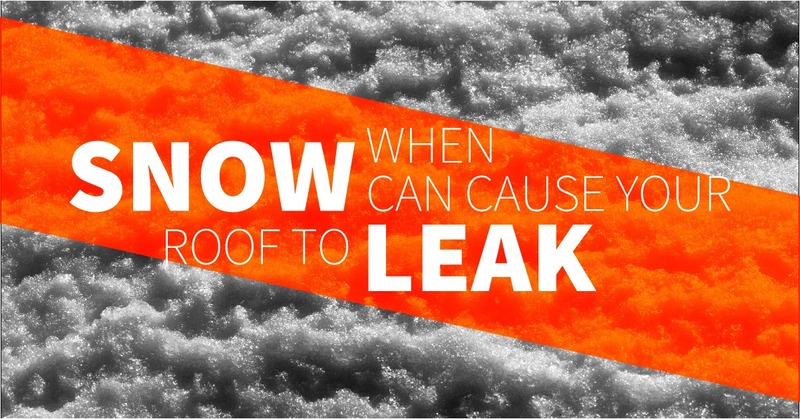 Can Snow Cause Your Roof to Leak? Inches of snow adds weight to your flat roof, as the extra weight can cause sagging and leaking before it ultimately collapses from too much distress. Snow can get into any weak areas on the roof, as the melting causes ponding, which seeps into the building. Another problem with snow is it could melt and refreeze. Ice dams and condensation, which are caused by similar snowy conditions, can be other reasons for leaks on your commercial roof caused by snow. Is Roof Snow Removal Necessary? An effective way to keep your maintenance costs for roof snow removal under control is to develop a plan in which you keep your snow load to a minimum and remove the snow and ice immediately. In the winter of early 2015 dozens of Boston roofs collapsed from record-setting heavy snowfall over a two-day period. The Boston Globe interviewed structural engineer Todd Fratzel, who advised home and building owners if snow piles higher than 18 inches on the roof to have it removed. But keep in mind the warning from the Federal Emergency Management Agency (FEMA), in which people and roofing structure are both at risk when someone without roofing experience attempts to remove snow from their roof. To avoid improper installation from an inexperienced roofer who will cost more in the long run, contact a certified, reliable roofer with a longtime reputation in your community. The best way to maintain your roof for durability and performance is schedule periodic inspections with a professional roof inspector, who can catch damage from snow early to avoid higher repair costs. The roofer will check your gutters, flashings, and other roofing components as well. Consider working with Vanguard for snow removal from your roof. We are confident our trusted specialists can provide superior quality for roof snow removal and any other roofing needs. Call us at 800-222-1272 for more information and for a free consultation.